Miss Clara McKenzie, visited friends in Tacoma and Olympia the first of the week. On account of high water Yelm has had no mail today, and will have none until some time tomorrow. No. 2 from Portland, which is due at 6:00 p.m., did not arrive until about 1 a.m.
F. J. Mosman made a business trip to Tacoma Tuesday. J. Cabana drove to Olympia this week. Misses Clara McKenzie and Ned Conine went today to visit Messrs. Roy McKenzie and Joe Melvin in their bolt camp about 16 miles above Yelm. Sam Price has rented the farm of Mrs. Collins about eight miles from here. He will take possession March 1. J. L. Mosman and family spent Sunday with Mr. and Mrs. L. N. Rice. Mrs. J. C. Conine spent week in Yelm. L. N. Rice went on business to Seattle Monday. T. M. Chambers made trip Monday to the Chambers slaughter house near Olympia. L. J. Byrne was in Yelm Monday purchasing supplies for his boarding house. He is keeping quite a number of the men who are cutting shingle bolts near his place. H. E. Warren, commercial traveler for the new wholesale dry goods and notion house, the Morris-Smith-Miller company of Tacoma, was in Yelm Tuesday looking after the interests of his firm. Charles Gaby, of Oregon was the guest of J. A. McKenzie and family a few days this week. W. C. Lawrence, of Seattle, has returned to his ranch above Yelm. He had several teams unloading a car of household goods Wednesday. Isaac Taylor and T. S. Pringle departed for North Yakima Wednesday. Mr. Taylor had been visiting his sister, Mrs. V. Longmire, and other relatives near here. Mr. and Mrs. Joe Cabana, Mr. Swanson and Miss Miles were visitors in Olympia during the week. Frank M. Eddy, of Glenwood, Minn., and Geo. Eddy, of Minneapolis, Minn., went out of the Capital City Tuesday eve to catch Friday morning’s overland at Tacoma. A telegram had been received announcing that the funeral of Mrs. Whitlatch , whose death occurred at Cedar Rapids, Neb., the morning of the day that Mrs. Eddy died, was held Friday at that place where able had a son buried. We would not appear ungrateful, but had not those who have returned to their far off homes since the last sad rites and the other relatives and near friends in this state charged us with the duty we would write no more mere words appear such an empty protestation in return for the kindness and fraternity shown us, strangers and comparative strangers, as we are, that all that we would say if able must be inferred. Miss Hattie Miles drove to Olympia Monday. J. L. Mosman was on a business trip to Tacoma. Sam Price and family now occupy the Collins place, which thy have leased. George Mills and daughter, of Centralia came to Yelm Saturday. They furnished the music for dance that night. G. W. Whitlatch has been confined to the house the most of the week with grippe and neuralgia. J. C. Conine, of Yelm, was in the city Monday for the first time since last fall. The “Capital” acknowledges a brief visit. Foresters of America were treated to quite a program by Captain Otis and his “Slabtown Irrepressibles” Wednesday night. At next meeting Captain Eddy and the “Nob” Hill Invincibles” have charge of the program and they won’t do a thing to Otis and his side-kickers. A social dance was held in the Collins school-house southeast of Olympia, last Saturday night. About 50 couples were present and an enjoyable time is reported. V. H. Eddy has returned to is work in the Tenino mills after a wrestle with the grippe at “The Ranche,” The “Weekly Capital” residence, in this city. Mr. Frank Mosman, one of Yelm’s merchant, was visible to the naked eye in Olympia Monday. D. R. Hughes wheeled in from Yelm Wednesday, to represent the Yelm camp at the M. W. A. county convention. On and after April 1, all poultry in the city limits will have to be kept confined and chicken pot pie has been on the daily bill of fare in many city homes this week. On September 1 the biddies will again be allowed to run at large. Modern Woodmen of America county convention was held in this city Wednesday. Joseph Reder, of Olympia, was elected delegate, and Lee Waddell, of Rainier, alternate, to the state camp at Walla Walla. They were instructed to work against the re-adjustment plan proposed by the head camp. Principals Fred Brown of Bucoda, and W. T. Dodd of Tenino, have swapped pupils for the eighth grade examinations. E. Longmire, who lives near the Bald Hills east of Yelm, recently lost six head of fine young cattle by eating wild parsnips. Lew Eddy, of Rainier made a business trip to the capital city Monday. 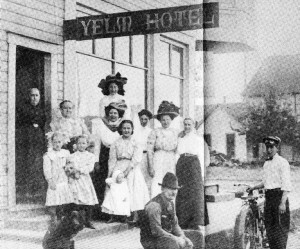 Mr. and Mrs. S. C. Paaf, of Yelm, made a pleasant call while in the city this week. A mill is being put in near Yelm by George Cassell. S. C. Paff, of Yelm, was in the city Tuesday. It must have been his busy day for he failed to get around to swap lies with ye editor. “Jim” Goodwin, of Card’s camp, succeeded in bagging two large bears up the Nisqually recently. C. G. Longmire and Wm. Price, Yelm’s star pole cutters were visited by a bear last week. Mr. Price, who had always been anxious to see a real, live bear, climbed a tree to get a good view. Being satisfied that it was a real bear, also a live one, he staid there. Mr. Longmire went for a drink. Frank Longmire and his mother visited old-time friends Wednesday and incidentally added to the “Capital” subscription list. The Modern Woodmen of America gave a great ball at Yelm Saturday. Mr. Ross Chilson has purchased a heavy draft team of Landlord Tunin of olmypia Hotel, for his bolt camp up the Nesqually. Consideration $425, and a good buy at that. Mrs. F. J. Collins and daughter Ruth, and her father, brothers and sister, of Iowa, were among yesterday’s callers. The brother and sister have been visiting Mrs. Collins since February, the elder Mr. Stickleman a couple of weeks. F. J. Mosman is home from the Tacoma hospital, where he has been undergoing a siege of typhoid. George Dewitt and Mr. Cartwright, the “resort,” went “bar” hunting this week. Beaers all safe at last accounts. Shingle bolts will soon be sent floating down the Nisqually. The big drift is now open and hauling will begin in a few days. D. R. Hughes, of Yelm, came over Friday to see the president. The socialists over there have got him scared and he thinks this is the last republican president he we’ll ever have a chance to see. The Yelm people are non-partisan and everybody went to see the president. But the only was one life-long democrat squared his conscience was to leave his tax-paying over to that day. Card’s bolt driver will start with the first rive of the season June 5th, a drive of seven hundred cords with Charley Pe Ell in charge. Ern. Fox is hauling shingle bolts on a wagon to Nesqually River. He says it’s a strenuous life, but then, with a “full dinner pail” in sight, (nit) we should be happy, for we have a job. James Mosman and Mr. Rice took a trip to Olympia this week. On June 15 school district No. 66 in this county will secure $300 from the state with which to erect a new school house. The district voted bonds on March 24th and secured the loan from the state at 33/4% per cent interest. The district is located on the Nisqually River, six miles beyond Yelm. The application for the loan was approved sometime ago, and the land commission fixed June 15 as the date when the loan would be available. Mrs. W. J. Inman and Mrs. Biesen of Portland and Miss Coudery, of Chehalis, are visiting their sisters, Mrs. Claussen and Miss F. Coudery. Miss Edith McKenzie will teach the school on Schneider’s Prairie the coming term. She is will qualified, having been principal of the Woodland high school the past two years. There is no doubt that the only solution to the shingle solution is a well-organized complete shutdown of all the mills. The market is not really so bad as has been represented, but the public generally, especially in the Northwest, have gradually forced themselves to believe that the market had gone glimmering. All of this is mere rabble, and firmness on the part of the manufactures would be a great aid if it did not altogether remedy the evil. The market in the East is good, but a shutdown for one month would force the price of shingles upward. In portions of the East nothing but red cedar shingles are in the market and a shut-down would deplete it. Trade is dull, no snap at all, and there will be none until you get prices to move upward. Then there would be a rush of business, but not until then. as all are holding off and those manufacturers out there are the biggest chumps on this terrestrial globe, for, if they would close down for a month they would have every thing their own way again for some time. Why they don’t know enough to know when they are hungry. They are the laughing stock of the lumber country. There are no shingles to be had but red cedar and they are throwing away their golden opportunities. They ought to be locked up in the insane asylums. Hon. J. C. Conine, the Nestor of Yelm Democracy, was in they city Tuesday and Wednesday. I. V. Rathbun, was in the city Tuesday and transacted business with “The Capital.” Mr. R. is organizer of Yelm local of the Socialist party. P. B. Van Trump, of Yelm, will shortly take his annual climb of Mount Rainier alias Mount Tahoma. He will be accompanied by his daughter Christine who is enjoying a vacation from her duties in the office of the Postal Telegraph Company. August 18th M. W. Wilkins will be in Yelm, where out clear-grit comrades have challenged Congressman Cushman to meet him in debate. Now wait till “Cush” accepts-needn’t hold your breath. His scientific presentation of the socialistic solution of the wide-spreading liquor traffic was masterly and convincing, while his skillful handling of the various phases of the poiltico-economics showed personal experience. As a question answerers, also, Comrade Wilkins had few peers in the movement. Lew Eddy came with Lea’s bolt drive Saturday and left for his home at Rainier the same day. J. M. Morgan and I. V. Rathburn, of Yelm, drove over to the county seat Monday. V. H. Eddy of Lea Lumber company’s bolt camp was in the city the first of the week while they were moving the camp. Mrs. Morris and Miss Rice had a break down on their return to Rainier Saturday evening and “Clarence” warmed the telephone wires in attempting to locate them. County Supt. Henry has the school laws relating to the compulsory attendance of children between the ages of 8 and 15 years at the public schools printed in sufficient numbers so that every family may receive one. The Hon. J. C. Conine expects his three sisters from the east to pay him a visit in Yelm. L. W. Longmire wheeled in from Yelm to the socialist conference Sunday and returned via train Tenino on account of rain. Frank Mosman, the Yelm merchant was in the city recently. J. C. Conine and his wife were in from their home beyond Yelm this week. Thomas Garstang has purchased a 30 acre tract near Chambers Lake east of the city. Bige Eddy jr. took a three day’s hunting trip in the vicinity of Rainier but the deer roosted too high, so we are not feasting on venison. The old $5 bell cow ordinance has been re-incarnated intact and service thereon made without notice. Many a bovine who has been peacefully grazing to the music of the bells there many moons languishes in the city pound while her owner pursues the half-eagle necessary for her ransom. Hon. J. C. Conine, wife and daughter Neo, left on steamer Santa Barbara for Los Angeles where they will spend the winter. The “Capital” wishes them a pleasant voyage and an enjoyable visit. T. F. Seyfang is giving a series of enjoyable Saturday night dances at the Collins hall, about twelve miles southeast of the city on the Yelm road. John Reichel called on ye financial editor while en route to his home above Rainier from Murray’s camp Tuesday. We forgot to ask him to partake of our Christmas goose again this year but we’ll expect him just the same. Bige Eddy, 5th Ward, Chm. J. Hettrick, the Yelm merchant wheeled over Wednesday. He says it was a little too wet but not quite damp enough for canoeing. Frank Benson and Burdette Brightman, of Rainier, who have contracted to do the logging for Rathburn-Garstang mill near Yelm, were in the city Friday looking for horses. Frank Longmire, of the consolidated Yelm hotels, was in the city Wednesday looking for a cook. J. H. Sumpter, of Yelm, has been in attendance upon his father who has been quite sick at his home on the Eastside. V. H. Eddy has returned to Tenino after a few days visit with “we.” Just to keep him from getting lonesome we had him finishing off our house with meals. J. L. Mosman received his commission as postmaster Tuesday, and took charge of the office Thursday. His predecessor, P. B. Van Trump, intends to leave for Seattle soon. S. C. Knowles, the Tacoma timber buyer, was in Yelm Monday looking after his timber interests. J. L. Mosman became the happy father of another daughter Sunday. Mother and child are doing well. D. R. Hughes is building an addition to his blacksmith shop which he intends as a store-room for agricultural implements and hardware goods. The school in district #42, which as been closed owing to the illness of the teacher, Miss Birdie Cooper, reopened Monday. The Yelm children are busily engaged practicing for a Christmas entertainment under the direction of Miss Ethel Birch. The post office was moved into Mosman’s store Friday. P. B. Van Trump will assist in the care of the office until after the holidays. L. J. Byrne, who is teaching at District No. 53, was in town Saturday. Frank Mosman left for a short stay in Tacoma Tuesday. There will be a grand masquerade ball here Christmas night at Conine’s hall. It is expected that many people from Olympia and other places will attend. We’ll treat them right if they come. Frank Longmire made a trip to Olympia Wednesday. F. J. Mosman commenced building an addition to his warehouse this week. Lee Conine was in town Saturday. Mr. Conine says his father, J. C. Conine, who is in Olympia, writes that Washington is the place for him. Miss Lilian Abernathy, who is teaching at District No. 66, spent Sunday in Yelm. Miss Jennie Coates and daughter left for South Tacoma Thursday, where she intends to reside in the future. Mrs. Coates has lived in Yelm fourteen tears and she will be missed very much by many friends here. W. H. Price and Una Waite, of Yelm, were married in Olympia, Wednesday. They have the best wishes of their many friends. Bucoda – A number of salmon have begun to come up the river and everyone is having sport in catching them. About forty were caught in one day.